Following an extended hiatus of about 5 years, Seattle dream-space merchants Sky Cries Mary returned with nearly the same lineup intact, and then began playing live dates in the Pacific Northwest in lieu of heading straight into the studio once more. Having never recorded an official live album during their first life, the band took the opportunity here to give fans an excellent 2CD package entitled 'Here and Now' (Hoodooh, 2005) full of great renditions of all their best material from the days when they found themselves attached to the Warner Bros. label and mass distribution made them fairly well-known throughout the States if not the world. With that behind then, the band now have made their first new studio recordings available (in traditional CD format or MP3 download), 13 tracks presenting their trademark dreamy-yet-majestic sound in a somewhat new fashion. On 'Small Town,' the songwriting is perhaps folksier, more basic, and less focussed on long instrumental sections than ever before. Therefore, the husband/wife singing duo of Roderick and Anisa Romero here take center stage even more than usual, such that it almost comes across as "their" album with the rest of the band more in a support role. I don't know if that is an accurate description of how the album came into being, but nevertheless the results are quite satisfactory. The opening title track reveals right away the underlying theme of the album, ie., relatively short, not terribly complex, lyrical songs about simple life experiences in the city, with all the obligatory geographical and cultural references in place. Oddly though, the city in question here seems to be New York City as opposed to their home in Seattle. Musically, "Small Town" (the song) is the most beautiful and dreamy of all the songs presented on the album, and blossoms spectacularly in several instances, leading into the chorus each time with some very cool circular guitar and synth licks intertwined. Next, "Rainfall" is another excellent song, not too heavy but still a rock number, with Roderick and Anisa singing alternately as opposed to together (separated by a full octave, ie., not harmonizing) as they so often do. Roderick's voice here sounds more confident and "musical" then ever before, so that overall 'Small Town' is perhaps SCM's best effort in terms of vocal performance. Anisa's angelic voice is pretty much unchanged (thankfully) and stands out not only in lyrical form but often times also on the backing tracks doing a kind of space whisper, as on the 3rd track "You Are." "Find a Way" is another strong composition with a great variety of vocal stylings from the two Romeros, and a very tasty underlying bassline from Juano Davison, plus all the usual dreamy soundscape backdrops. Following the folk ballads "Hovering" (partly semi-acoustic) and "Travel Light" (fully acoustic), SCM comes back with another rock anthem "Five Train," one more day-to-day life experience story put to music about a commute in the Big Apple. Somewhat reminiscent of the classic SCM "Elephant Song" (from 1992), Roderick here again narrates a story in spoken-word form on "Land of All" atop a simple funky rhythm, although the chorus again returns to their signature wall-of-sound (here a little post-rock-style shimmery echo guitar) as the tapestry for Anisa's response - another beautiful song in all. SCM usually throws in one modern dance/hiphop-flavored song onto their albums for a change of pace (and as a basis for the dreaded dance remix EPs), and here "I'm Always Home" fill that role. Some of their earlier efforts in this department were surprisingly effective, but this one leaves me cold and is the lone skip-forward moment on 'Small Town.' "Missing," however, is a gentle and pleasant piece of ambient bliss, not too different from what Anisa had been doing with Jeff Greinke (under the name Hana) during SCM's hiatus. The album wraps up with just a short bit of funky electronic rhythms (foreshadowed earlier) and Roderick's chant "Get your heart above your head, baby, before you go to bed." Not a bad sentiment to end up this collection of simple stories and wisdom. 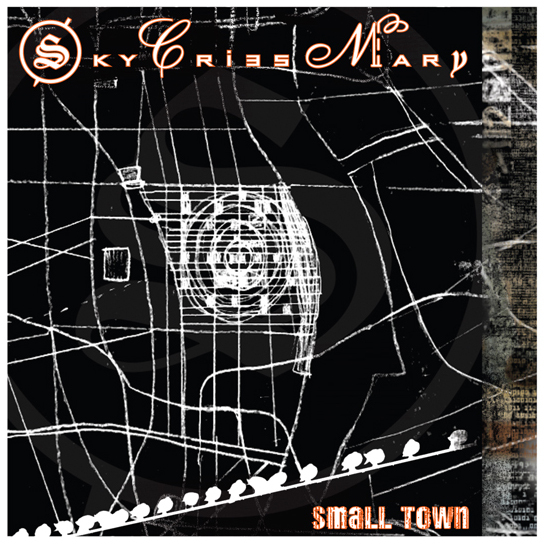 I've been carrying around 'Small Town' on my iPod for the last two months during my summer holidays in Europe, and this album has been continually growing on me ever since I first heard it. It will likely never quite reach the heights of albums like 'This Timeless Turning,' which had so much wonderful music over a huge dynamic range (everything from heavy psych jamming to pure ambience), but it nevertheless is a welcoming sight to have the band back together and still pushing their creativity into new forms. It took some time at first to recognize how innovative a band SCM was in their earlier days in redefining what "space rock" could sound like and what modern sounds it could incorporate without losing its soul. But over the years, my fondness for and recognition of this band's importance in the long run continues to grow, and now we see another fine product from what is now a very well-tuned and mature "orchestra." Let's hope there are no more hiatuses in the near future...the obviously still have something to say.